Animals Australia investigator and Campaign Director Lyn White and the television crew from ABC's Landline recently travelled to the Middle East to document the ripple effects of Animals Australia's eight investigations in the region as well as the impacts of cultural modernisation. The results are profound — a steep decline in live exports in recent years; an end to on-selling of animals into boots for home slaughter in the main importing markets; as well as a dramatic increase in pre-slaughter stunning throughout Jordan — a direct result of Animals Australia's alliance with HRH Princess Alia Al Hussein through the Princess Alia Foundation. Animals Australia's years of relentless investigations and campaigning to expose and end the cruelty of live export are having an impact. As fewer live export ships depart from Australian shores, millions of animals are being spared from the routine horrors of live export. And through the courage and leadership of local advocates such as Princess Alia of Jordan it is clear that the perceived preferences for traditional slaughter methods can be easily overcome — which is already reducing the suffering of millions more animals in Jordan. Although with another 2.7 million Australian sheep destined to be exported and killed in slaughterhouses throughout the Middle East in the next 12 months, there is still much work to be done. The Australian Government's new supply chain restrictions will be rolled out across the region in 2012. However, these restrictions fail to protect Australian animals from enduring the terror of fully conscious slaughter — something the Royal Jordanian Princess maintains is within Australia's rights to demand from the Middle East. Despite having the means and opportunity to extend this most basic protection to millions of Australian animals exported through its new supply chains, the Australian Government along with live exporters have again traded the welfare of animals for the economic interests of a cruel industry. In the coming months, your federal MP will be presented with a critical opportunity to redress this omission when a new Bill lodged by independent MP Andrew Wilkie goes to a vote in Federal Parliament. 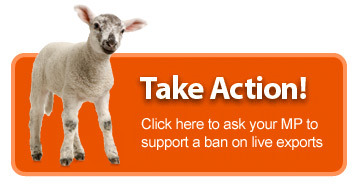 Please click here to send your MP an instant message urging them to use their power to help end the cruelty of live animal export.